Приводяться приклади некоректных записів виразу для допплерівської ширини спектральних ліній в деяких літературних джерелах, внаслідок чого відповідні оцінки нетеплових швидкостей виявляються різними. Як приклад показано, що оцінки нетеплових швидкостей, отриманих в роботі [Patsouracos S., Klimchuk J. A. Astrophys. J. 2006. 647. P. 1452], завищені на 30... 40 % порівняно з істинними значеннями. 1. Засов А. В., Постнов К. А. Общая астрофизика. 2006. M.: МГУ. 173 с. 2. Звездные атмосферы / Под ред. Дж. Л. Гринстейна. 1963. M.: ИЛ. 129 с. 3. Постнов К. А., Засов А. В. Курс общей астрофизики. 2005. M.: МГУ. 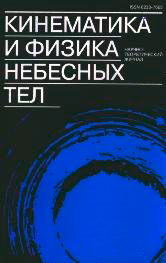 160 с. 4. Соболев В. В. Курс теоретической астрофизики. 1967. М: Наука. 95 с. 5. Antolin P., Rouyppe L. van der Voort. Observing the fine structure of loops through high-resolution spectroscopic observations of Coronal rain with the Crisp instrument at the Swedish telescope. Astrophys. J. 2012. 745. P. 152—173. 6. De Pontieu B., McIntosh S. W. Quasi-periodic propagating signals in the solar corona: the signature of magnetoacoustics waves of high-velocity up flows? Astrophys. J. 2010. 722. P. 1913—1029. 7. Dere K. P., Bartoe J.-D. F., Bruecner G. E., Cook J. W., Socker D. G. Discrete subresolution structures in the solar transition zone. Solar Phys. 1987. 114. N 2. P. 223—237. 8. Dere K. P., Mason H. E. Nonthermal velocities in the solar transition zone observed with the high resolution telescope and spectrograph. Solar Phys. 1993. 144. P. 217—229. 9. Harrison R. A., Hood A. W., Pike C. D. Off-limb line profiles and the search for wave activity in the Low Corona. Astron. and Astrophys. 2002. 392. P. 319—327. 10. Konjevic N., Dimitrijevic M. S., Wiese W. L. Experimental stark widths and shifts for spectral lines of neutral atoms (A critical review of selected data for the period 1976 to 1982). J. Phys. and Chem. Ref. Data. 1984. 13. P. 619—632. 11. McClemens K. G., Harrison R. A., Alexander D. The detection of wave activity in the solar corona using UV line spectra. Solar Phys. 1991. 131. P. 41—48. 12. O'Shea E., Banergee D., Poedts S. Variation of coronal line widths on and ofthe disk. Astron. and Astrophys. 2003. 400. P. 1065—1070. 13. Patsouracos S., Klimchuk J. A. Nonthermal spectral line broadening and the nanoflare model. Astrophys. J. 2006. 647. P. 1452—1465. 14. Rankine W. J. M. On the thermodynamic theory of waves of finite longitudinal disturbance. Phil. Trans. Roy. Soc. London A. 1870. 160. P. 277—291. 15. Verwichte E., Marsh M., Foullon C., Van Doosselaere T., De Moortel I., Hood A. W., Nakariakov V. M. Periodicspectral line asymmetries in solar coronal structures from slow magnetoacoustic waves. Astrophys. J. Lett. 2010. 724. P. L194—L198. 16. Zaqarashvili T. Spectral line non-thermal broadening and MHD in the Solar Corona. AIP Conf. 2009. 1121. P. 114—122. 17. Zhao G. Q., Wu D. J., Wang C. B. A study of line widths and kinetic parameters of ions in the solar corona. Astrophys. and Space Sci. 2014. 353. P. 373—386.